In an interview with New Sunday Express, actor Anupam Kher says his appointment as the Film and Television Institute of India’s new chairman is all because of the work he has done. Newly-appointed Film and Television Institute of India chairman Anupam Kher, who has had his share of controversy in the recent past, said he is least bothered by sections of the film fraternity questioning his credentials for the job. 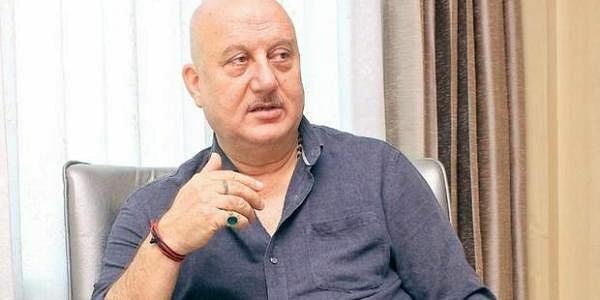 Kher, 62, is seen by some to be close to the Bharatiya Janata Party and his detractors in the film world have claimed that Kher was appointed because of this proximity. The well-known actor with 508 films under his belt has been trolled on social media for his comments on nationalism, intolerance and even Kashmir. But Kher, in an interview with New Sunday Express, said he was happy to be unpopular with certain sections of the people and popular with the rest. Calling for the abolition of Article 370, he said he was unhappy with the way the Kashmir situation had been handled by successive governments. He said historian Ramachandra Guha’s criticism of Army Chief General Bipan Rawat for seeking Bharat Ratna for Field Marshal K. M.Cariappa was uncalled for. Have you been able to mend fences with the film fraternity, which was against Gajendra Chauhan’s appointment? It is not important to me what people’s opinion is. You can’t deal with life based on what people think of you. I don’t owe my career to them and they don’t owe their career to me. But the overall reaction from the people in the industry, business and others has been warm. Your appointment was seen as a reward for your proximity to the BJP. If I was made the chairman of the Bhabha Atomic Research Centre, then I would say a favour has been done to me. My appointment (as FTII chairman) is all because of the work I have done. It is like saying Virat Kohli is the captain of the Indian cricket team because he is the BCCI’s (Board of Control for Cricket in India) blue-eyed boy. He has reached where he has reached because of his hard work. You mean to say people who are not deserving are appointed to key positions in our country? I have gone beyond that possibility of thinking. Any political ambitions in the near future? When I have the ambition, I will announce it from the rooftop because I will need people’s support. You should never say no to anything. But I can easily say that I have no such intention for the next five years. I am a full time actor, writer, teacher. I also give a lot of motivational lectures. The FTII appointment should not be seen as a step towards that direction. If people want to come to their own conclusion because it suits them so be it. In the past, I have spoken about the country and other issues and they (people) feel the next step for me is politics. That’s a tragedy. What is your opinion on intolerance in the film industry? How can you make everyone happy? Even in our family, we don’t have one opinion so how can you have one opinion in a 125 crore nation? When I tweet in favour of Mr (Narendra) Modi people think I support him. But I have never hidden my admiration for that man. He is the Prime Minister of the country with an absolute majority so he must be good. It’s been nearly a month since your appointment as the FTII chairman, how has been the experience so far? It is too early to speak about any change. Also the change is very silent and you will not discover it overnight as it’s not a building that has been refurbished. I have already visited the place twice, I am constantly in touch with the registrar, the director and I have spoken to old students associations. I also spoke to previous directors and technicians. So, it is only after my term that you will see the changes. How do you think your tenure will change the controversies surrounding the premier institution? We can’t take away the legacy of the FTII, which was established in 1960. We can’t decide the hard work of previous chairmen, directors and teachers based on one appointment (Chauhan) that went wrong. I don’t want to talk about the person before me and I don’t have to highlight my work by saying that he was not good. You led a campaign to counter left liberalism. How far you have been successful? I'm not a crusader. I try to keep away from Twitter these days, especially when I read reactions of a few people. There is this big historian who says the Army chief speaks a lot. But why shouldn’t the Army chief speak? In which manual is it written that the Army chief shouldn’t speak? If I am truthful to myself, I am not worried about being unpopular. I am happy to be unpopular with certain sections of the people and popular with the rest of the world. I have seen these left wing people travelling first class in aircraft. They don the jhola look only in India. Congress vice president Rahul Gandhi’s social media account has suddenly got a lot of traction. Is it a makeover? It’s very good if he is doing it. He tweeted a shayari sometime back and I would really like it if he recites it at some platform. I am happy that he has got a good team now. I would not like to comment any further. What about the controversy surrounding Sanjay Leela Bhansali’s fim Padmavati? I think Censor Board is the authority. It now has a very balanced person in Prasoon Joshi and it should be left to him. He will decide what is to be done. A controversy erupts on everything and I feel it is important to see somebody’s work and then comment rather than reacting to perception. Justice for Kashmiri Pandits is an issue close to your heart. Do you think the BJP-PDP government is doing enough? Nothing has happened on the ground so far and I have always felt that the best thing for Kashmir is to abolish Article 370. The youth and people of Kashmir are able to enjoy the progress in the rest of the country but no such thing is happening in their state. We should not pay any attention to separatists, we are the ones who are making them important. Do you see GST and demonetisation affecting the BJP’s chances in the Gujarat elections? I am not interested in commenting on this as I am not an authority on everything. Everything is fair in politics and we are the largest democratic country. Whatever is being done by the government is based on the constitution. You have donned many hats, how do you strike a balance? I am capable of doing this. I do things which interest me. My grandfather used to say that a busy person has time for everything. I do what I want to do, very few people get to do what they want to do. I feel I am the chosen one. The busier I am the sharper I will be. You have transformed your body. How did that happen? It took a lot many years to realise that the body is equally important like the mind. I have kept a bad picture of mine next to my bed and every day I get up seeing it. I have dear friends like Anil Kapoor, Akshay Kumar, Salman Khan who pushed me towards physical activity.